Our range of products include solar battery. Solar batteries are designed to last longer and rugged enough to be used in any weather condition. 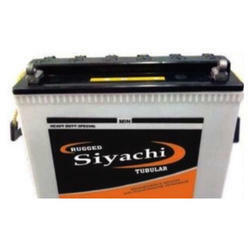 Lead acid batteries are used as an energy storage medium for solar battery banks. The amount of solar energy a battery can store and release when needed is limited to the batteries ‘Capacity Rating’. Batteries are rated according to their voltage, ampere hours(AH) of storage and their ability to deliver the stored energy over a given period of time known as C rating i.e C5, C10, C20, C100. Deep cycle flooded lead acid batteries areused for solar energy storage in stand-alone solar power systems. Solar batteries are designed at C/10 rating for deep discharge performance. It has the capacity to sustain partial state of discharge. The Ah efficiency of the battery is greater than 90%; efficiency is greater than 75%. Solar batteries need water topping twice a year due to the large electrolyte volume. Solar batteries are designed for deep cycle capabilities and longer service life and being capable of withstanding deep discharge and over charge.